Ea O Ka Aina: Under New Management? SUBHEAD: Is Trump just another variant of the Deep State stranglehold on the Untied States? 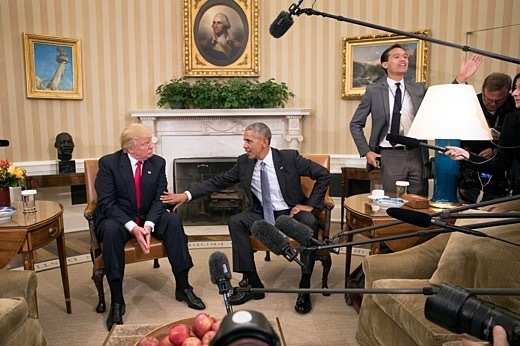 Image above: Obama meeting in White House with Donald Trump after he won the presidential election. From (https://www.nytimes.com/2016/11/10/us/politics/transition-briefing-passing-the-presidency-to-donald-trump.html). Mister Obama did not put an end to Guantanamo as he promised. And, although he did remove troops from Iraq (only to send them back a few years later), he expanded America’s military adventures overall, invading numerous sovereign nations. As for his promise to come down hard on the sworn enemies of democrats—the evil usurpers on Wall Street—he instead dug in deeper. His Treasury secretaries were banking insiders, not the “reformers” that had been anticipated. Many who had voted for Mister Obama were deeply disappointed. Under him, government had grown, warfare had expanded, the economy worsened and Wall Street became even fatter than before. In 2016, Americans, in large part, sought the selfsame changes—less central government control, less overseas aggression and a reigning-in of Wall Street and banks. So, what are the odds that they’ll receive those changes? Let’s have a look. When a new leader is elected, the best first assumption to make is that his campaign promises probably had little or no relationship to his actual intentions. More likely, his intentions will be to continue to pander to the Deep State and those that helped him to get elected. Therefore, it’s always a good idea, in any country, to pay attention to the new leader’s choice as his posse. The US president-elect has been active in choosing the gunslingers who will ride with him into Washington and the choices may provide an early warning as to who the new president really intends to be. So, first off would be his closest advisors—his chief of staff and his chief strategist. Mister Trump’s choices, respectively, are Reince Priebus and Stephen Bannon. Mister Bannon is a Goldman alumnus. In addition, Gary Cohn, Goldman’s president, has been chosen as director of the National Economic Council. By any measure, the cabinet will be somewhat of an extension of Goldman. Mister Trump railed against Wall Street during his campaign and vilified his opponent on Twitter, stating, “Hillary will never reform Wall Street. She is owned by Wall Street!” His supporters had every reason to expect that he would prove to be the reformer they hoped for, yet his choices above suggest that that’s not the plan. This likelihood is further enforced by his choice of Steven Mnuchin, who spent 17 years at Goldman, as Treasury secretary. His choice for commerce secretary is Wilbur Ross, a billionaire investor who is also unlikely to emerge as an advocate for reform. His choice for national security advisor is Lt. Gen. Michael Flynn, whose primary focus is in ramping up tensions with Iran. His choice for secretary of defense is Gen. James Mattis, who has declared his desire to invade Iran. In addition, Mike Pompeo, who also favours an invasion of Iran, has been selected as head of the CIA. These choices are not likely to sit comfortably with Mister Putin, with whom the president-elect suggests he will enjoy a good relationship. Nor will they sit well with the many throughout the world who already feel the US has gone far beyond its limit in seeking to police the world. Rather than back off from the dreaded Wolfowitz Doctrine, the choices of cabinet members, taken collectively, suggest a continuation of the foreign boondoggles that began in 2001. The one departure may be in the important position of secretary of state, Rex Tillerson, a lifetime employee of Exxon who has developed good relations with Russia and opposes government regulation of business. He may be the one pick that reflects Mister Trump’s campaign claims. Still, Mister Tillerson falls right in line with the ever-expanding corporatist relationship extant in the US government. Finally, those who hope that Trump will reverse the trend of the Deep State’s near-total control over the US will be disappointed not only by the choice of Mike Pompeo for the CIA, but of Trump campaigner and establishment insider Jeff Sessions as attorney general. None of the above guarantees that the voters who chose Mister Trump will soon be experiencing buyer’s remorse, but the indicators that Americans may find themselves out of the pan and into the fire are significant. There’s an old saying that “the more things change, the more they stay the same,” and the lineup of new players above suggests that that may well be the case in the next administration. Meanwhile, not only the US, but the entire world will be holding its collective breath over the coming months. The new president is less likely to spend as much time on the golf course as his predecessor. He’s far more likely to hit the road running. The question will be in what direction he chooses to run. His choices for cabinet suggest that that direction might have less relationship to his campaign rhetoric and more relationship to the ongoing Deep State program. To be sure, his clear choice of Washington insiders for so many of his primary cabinet positions informs us that the swamp will not, in fact, be drained. Big Business, the military-industrial complex and Big Banks will dominate the Trump cabinet.